Persnickety is pleased to offer several lines of invitation designs from different national manufacturers, including Carlson Craft, Designers’ Fine Press, William Arthur, and Crane brands. We have 40+ albums of predesigned invitation sets from these manufacturers that a bride can order in our studio. There’s often less customization involved in some of these designs. But there is an enormous variety of styles, themes, and pricing. It’s an excellent place to start your wedding invitation search! You absolutely cannot go wrong with an album or a custom invitation. But, sometimes, brides are unsure of which path to take. 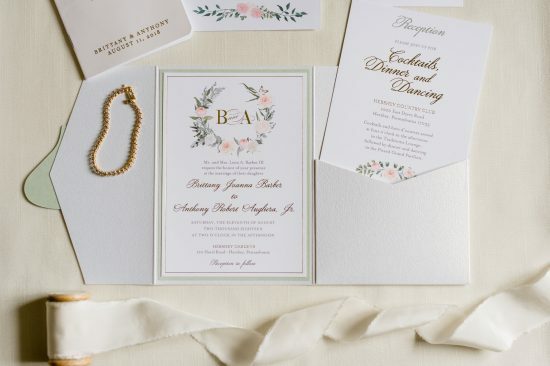 Because of this, Persnickety has compiled some of the top reasons we feel why brides ultimately decide to order a custom invitation. You want a unique invitation totally customized just for you. 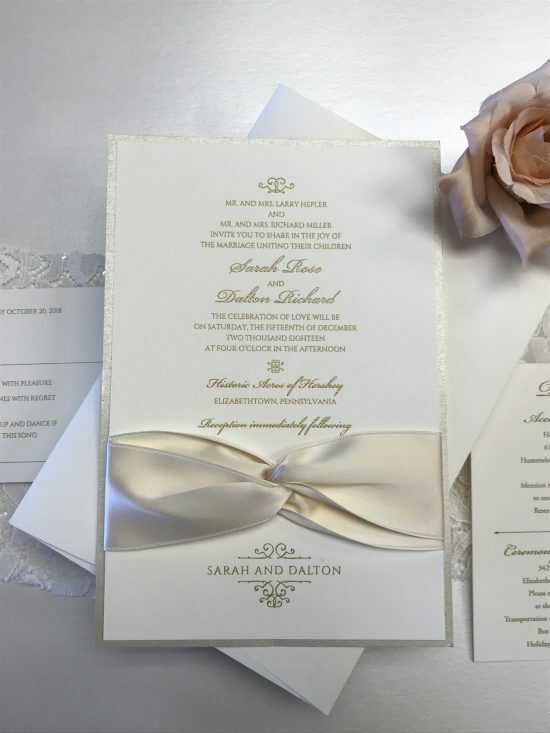 Custom invitations are unique in that their designs have limitless customizations for paper choices, graphics, and embellishments. They are designed exactly for you. 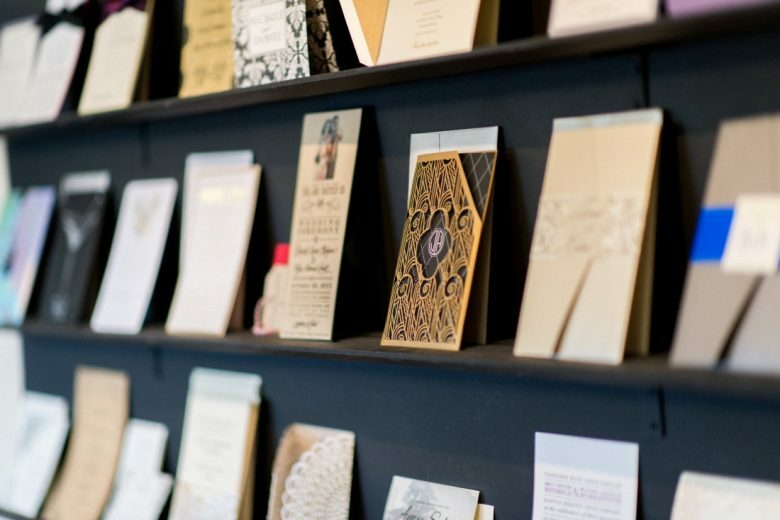 This is a major reason why brides opt for custom invitations. They are looking for specific elements that reflect their personality or their wedding day, and this sometimes can be more challenging to convey through an album invitation. A sweet twist knot on Sarah and Dalton’s customized album invitation. If you have searched through many invitation albums and nothing jumps out to you as “the One,” it might be time to meet with a designer to discuss a custom invitation. You may as well get an invitation you love instead of settling. Wedding planning, combined with everything else you need to do in your life, can often lead to a stressed out bride that is known as a Bridezilla. Persnickety wants to help brides avoid becoming one of these! We are happy to offer our brides full service custom invitations if the bride prefers to be hands-off regarding her wedding stationery or if the bride lives out of town but still wants to work with us. 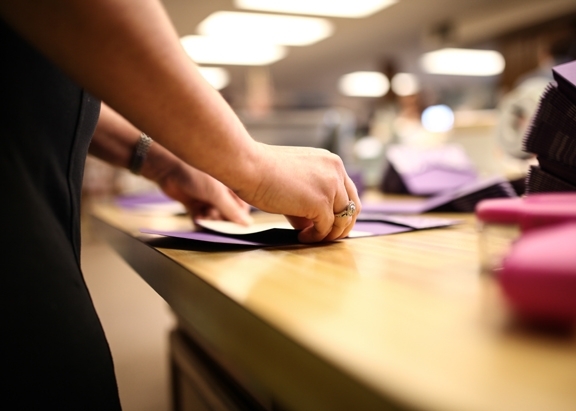 Besides the consultation, design, and proofing of the custom invitation, our full service includes assembly, stuffing, stamping, and mailing of your invitations. Though there is still a time commitment required for you to meet with a designer, it is a lot less of a commitment than having to assemble, stuff, and mail yourself. 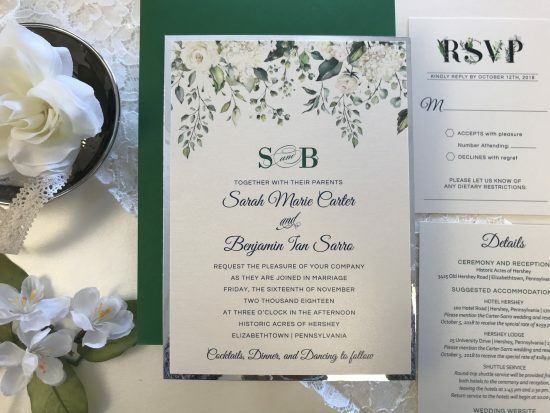 If you think full service custom invitations might be right for you, give us a call to schedule an appointment to discuss your needs with a designer! Though the designers at Persnickety are not exactly polyglots and fluent in multiple languages, we certainly can help create an invitation that suits your specific needs, regardless of how specific they might be. If your ideal wedding includes elements that are consistent throughout the entire event, it is wise to go with a custom invitation. The national retailers do offer a wide array of matching items for your wedding, such as menus, save the dates, and thank you cards. But for the items they do not carry and that you will have to order elsewhere, you run the risk of some of your items only sort of matching. 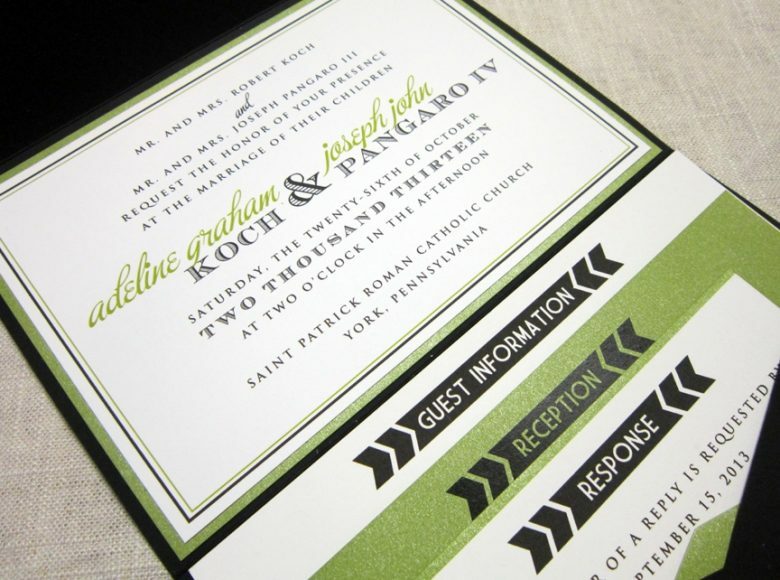 Because Persnickety limits their staff to a small number of monumentally talented graphic designers, a minimal number of people will be working on your custom invitations start to finish. We always try to personalize every wedding invitation we can, including our album invitations, and you will receive a higher level of personalized service the second you step into our studio. 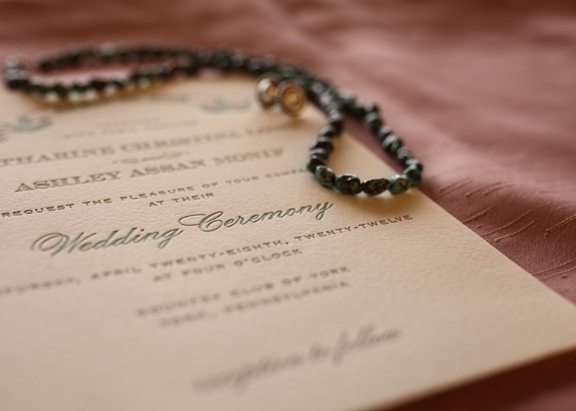 Do you think a custom invitation might best suit your wedding needs? 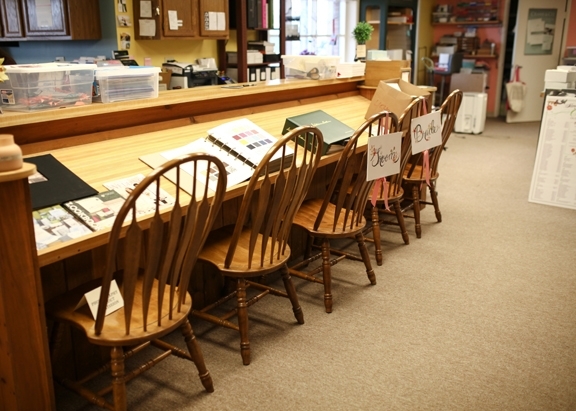 Schedule your appointment here and let us help you create the perfect custom wedding invitation.